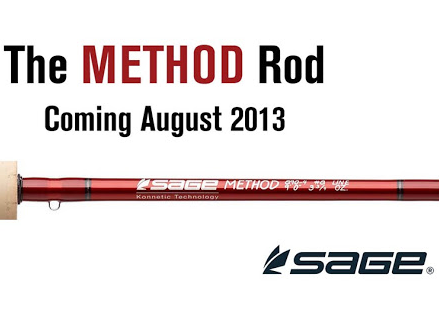 June 13, 2013 (Bainbridge Island, Wash.) – This summer, fly fishing industry leader, Sage Manufacturing announces the release of its 2014 premier collection of high performance rods called the METHOD series. These ultra-fast fly rods use Sage’s proprietary Konnetic technology. The METHOD delivers high line speeds and tight loops for extreme distance and wind-cutting casts all while maintaining critical accuracy and feel. The magma red colored shaft of the METHOD is complemented by rust colored primary thread wraps and pewter trim wraps. Fuji ceramic stripping guides and robust guide sets round out the features of this high-end rod series. The rods come in a black rod sock with a red silk-screen and are protected in a fusion red powder-coated rod tube with a silver colored medallion and gloss black end caps. June 13, 2013 (Bainbridge Island, Wash.) – As more and more anglers take to saltwater to expand their fly fishing experiences, industry leader Sage Manufacturing, introduces the MOTIVE fly rod series. MOTIVE saltwater rods are constructed of time-proven materials and embody Sage’s immense experience pursuing many hard-fighting saltwater species. The MOTIVE features an all-new taper design creating a powerful, fast-action rod that loads quickly to deliver heavy saltwater flies with the distance and accuracy the sport demands. Best areas to try would be the Dam wall, Seven Gates, Rushes Bay, Anglers Reach and Coppermine bay. A boat would be an advantage at present.Remember a slow retreive is working the best. Lake Jindabyne:- Jindabyne reports have been picking up every day over on the west side Olive woollie buggers have been the best. Conditions for polaroiding were great on the weekend the brown have been on the move so pick your days start early you will have better results. Jindabyne has produced few reports this week there are still some good fish to be cought in Jindabyne but early starts are the key to catching them big brown especially when the weather is super calm.Some nice fish taken trolling around the outside of the weed beds in many of the bays. Blade lures and Tassie lures are doing well on the big browns as will the Rapala X-Raps. Still good reports of good fish have cought around the Snowy arm and Kalkite. Reports off trolling close to the banks has been really good. Down the lower end off the lake is Improving every week drifting in a boat is working well with Blades and Rapalas rainbows and browns.